Liz Brodie at her home in Darnick. A Darnick fundraiser is set to walk 500 miles solo across northern Spain in just 35 days in aid of charity this spring. Liz Brodie, 61, sets off on that mammoth pilgrimage-style trek from the Pyrenees to the Atlantic coast in aid of a charity close to her heart next month. Liz’s daughter Caitlin suffers from inflammatory arthritis, so she is walking the Camino de Santiago de Compostela in aid of national charity Versus Arthritis. “This is a personal challenge for me,” Liz said. “My daughter who is 21 has had inflammatory arthritis for six years. “It’s not an condition you associate with young people. “It’s an immune system disorder which is progressive and has a bigger impact on your health than just aches and pains. Liz hopes to raise £5,000 in sponsorship and every penny will go the charity as she is funding the solo trip herself. “It’s a big target which I am really anxious about now as it’s a huge amount. 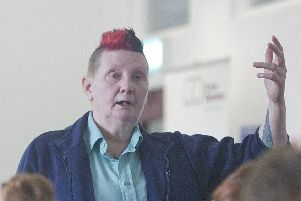 Liz , a former mental health nursing lecturer at Edinburgh Napier University, now guest lectures at Borders College in Galashiels, following her retirement in August 2017. But she’ll be taking more than month off from that to complete the 500-mile trek, which she will start on April 29 from Saint Jean Pied de Port, at the foot of the Pyrenees, and finish 35 days later in Santiago, Galicia. Liz and her husband Bruce, who works at Scottish Borders Council, have lived in Darnick for 26 years. Their daughter Caitlin is studying history and social policy at Glasgow University, and her brother Callum, 27, also lives and works in Glasgow.